After a very busy summer and spring in the music-part of my life, I hit a wall in September where I had to take a step back. Basically the day job was taking up a lot of energy and time which has meant reduced personal resources for music. Yes, I know, pretty sad isn’t it? Don’t worry, though, it’s only temporary! Having a bit of a break from public-facing-music-stuff has helped me not to burn out (too much) but I am hoping to get back into the swing of things in the new year. I’ll be working hard behind the scenes for the next couple of months as I prepare for my Guest of Honour concerts and workshop at 31-ET, the 2019 UK Filk Convention. I hope that, along the way, I can share some new songs with you on my Soundcloud account. Look out for those on my Facebook page and Twitter accounts. I’ll catch up with everyone after the new year but, in the meantime, have a lovely remainder of 2018 – may it be full of song, stories and friendship! Recording my debut solo EP has been a rather long process – I actually started the first arrangements back in the summer of 2014 up on the west cost of Scotland in a croft with no electricity but glorious views across Gairloch Bay. When I first started arranging the first of the songs, I didn’t play the harp and I was still struggling to do more than simple strumming on the guitar. I guess you could say that the journey to making my EP has been beautifully tangled up in my journey to become a better instrumentalist. 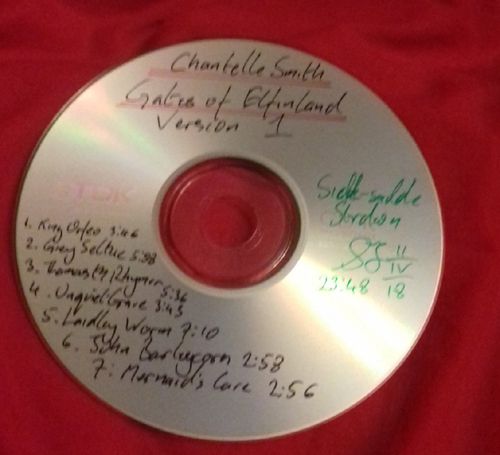 It did look as though the EP would be finished before Christmas last year but, frustratingly, I came down with a cold virus that kicked my immune system about for around 3 months. While the husky grumbly voice is fab in many ways, it’s not how I normally sound so I had to be patient, allow the virus to burn itself out and rest my voice so I wouldn’t damage it. Thankfully, the virus did kick the bucket and last month I was able to find time to record again. It only took two sessions and one more editing session to get the first cut of the EP. Now is the point where I have to listen through the cut and make notes on anything that isn’t quite right – ‘ear work’ as my wonderful sound engineer Simon Fairbourn calls it – so it’ll still be a bit of time before this lovely creation gets sent off to the replicators (along with fabulous cover art from Kevan Manwaring) but I’m hoping to have the EP ready for sale in time for my gig at the Swindon Folksingers Club on 22nd June. Keep watching here or on my twitter feed for more news on my EP!